If you're interested in conservation, sustainability, livable cities, and Memphis, read this short summary of Ed McMahon's comments from a talk in our city June 12, 2013. McMahon, Senior Resident Fellow at the Urban Land Institute, was in Memphis to advise on the Mid South Regional Greenprint and Sustainability Plan. Planning for conservation is as essential as planning for development, in fact, it can alleviate some of the stresses when planning for future development. Place-making is important. People come back and spend their money in places that attract their affection, and the natural approach can be the cost effective approach. You can place a value on a scenic view. Charleston, S.C. Mayor Riley: "We should give the best of the city to everyone." Creating valuable public spaces can improve overall property values and add to your city's sense of place. Tourism is all about being unique. Memphis needs to keep what makes it unique and that includes its old buildings and conservation areas. For a city to survive you need a healthy downtown, and you need historic preservation. Last year the Waterfront Center held their annual Urban Waterfronts conference in Washington, DC; in 2011 it was in NYC; in 2010 Baltimore; 2009 Seattle; .... Well this year, they're headed inland to our River, and a group from FfOR is headed there, upRiver to Davenport, Iowa. It's a great chance to see and hear what other cities are doing on their waterfronts - what's working around the world and why - and we hope you'll join us at the conference, Sept. 25 - 28. This year's conference is a bit different. 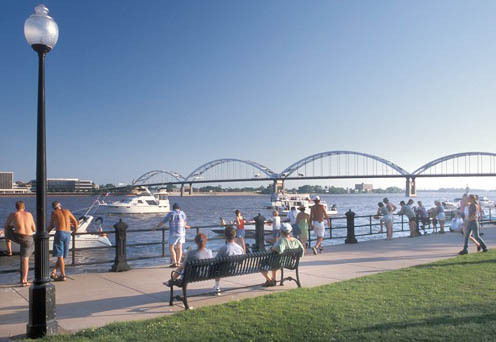 The Waterfront Center of DC and River Action, Inc. of the Quad Cities are collaborating to schedule and combine their conferences. You can attend one, both, or parts of both. Click HERE to access a pdf file with details. It can also be reached via the Waterfront Center website. The Waterfront Center was formed in 1981 to study waterfronts and to help cities define and transform what were often abandoned, underused areas for a wide array of uses, from parks and trails to mixed-use, residential, and industrial projects. 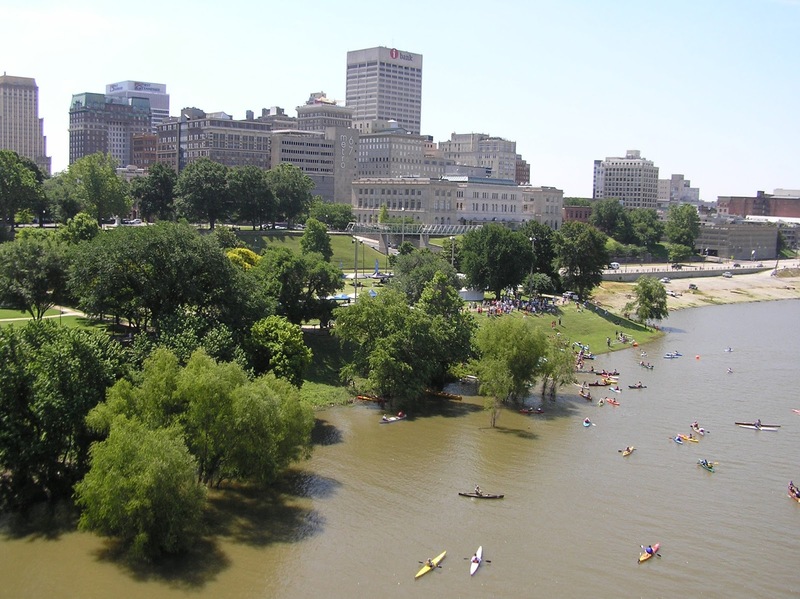 In 1999, they were hired by the City of Memphis to lead public workshops on our riverfront. This conference could be the start of getting us back on track, and we hope you'll think about attending. It may be a seven hour drive to Bentonville from Memphis, and it's not a River town, but, WOW, they're doing a lot of things right there. The authentic town square is alive day and night. The 1st Walton store has been preserved; there are offices and several restaurants to choose between; and a farmers' market on Saturdays. A plaza has been added that works as a water playground by day, a cinema by night, and, in the winter, it becomes an ice skating rink. A boutique hotel, 21c Museum Hotel, is getting rave reviews in publications from the "Huffington Post" to "Travel + Leisure." And it's not just a hotel with an excellent dining room and bar, it's also an art museum. And then, of course, there's Crystal Bridges, which houses one of the world's best collections of American art and is drawing visitors from nearby towns and cities around the world. Designed by Moshe Safdie, the building is suspended from cables and set into nature. No big signs here, but there is outdoors art, paths for walkers and bikers, and grounds planted with native species. No parking problems, either; most people walk the 1/3 mile path from the town plaza to the museum. Chicago's lakefront is lined with pathways, parks, and public institutions like the Art Institute of Chicago. 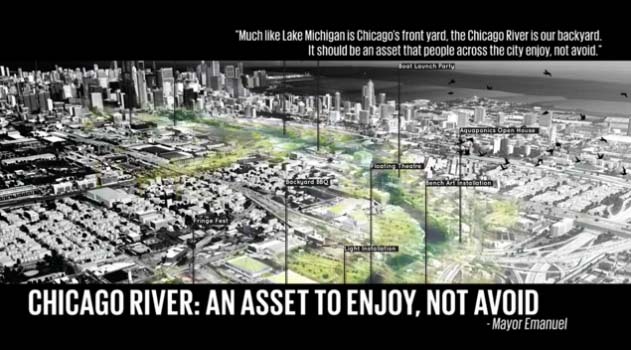 Last year attention switched to the Chicago River as Chicagoans and 12 designers from Harvard considered the river's potential to serve as a recreation, education, and transportation component of the city. "12 DESIGNERS, 12 VISIONS / Harvard GSD" 08 Apr 2012. Harvard GSD “Waterline” studio led by Phil Enquist of SOM. "Much like Lake Michigan is Chicago's front yard, the Chicago River is our backyard. It should be an asset that people across the city enjoy, not avoid." "Informed Sources: Beale Street Landing Fiasco"
For more info. about project overruns and delays, Council votes, what happened and when, scroll through articles HERE.